Well cut and polished, fine green actinolite needles in transparent colorless quartz, unique and beautiful gem! Rarely seen faceted gem chrysoprase. Well cut and polished, nice medium bright green throughout, moderately transparent, excellent clarity for this gem, very slight inclusion. Rarely seen faceted gem chrysoprase. Well cut and polished, choice medium bright green throughout, moderately transparent, very good clarity for this gem, minor white veil and some small limonite inclusions near girdle. Rarely seen faceted gem chrysoprase. Well cut and polished, choice medium bright green throughout, moderately transparent, very good clarity for this gem, very slight inclusion. Rarely seen faceted gem chrysoprase. Well cut and polished, medium pastel green throughout, weakly transparent, very good clarity for this gem, very slight inclusion. Reserved Rarely seen faceted gem chrysoprase. Well cut and polished very wide pearshape, nice medium bright green throughout, weakly transparent, very good clarity for this gem, minor limonite inclusions near edge. NGQ1 3.53cts 13.2x11.8 oval Australia SOLD Well cut and polished, unique cabochon with a well defined 3mm wide native gold vein running right through the center of the white quartz. Great conversation piece! 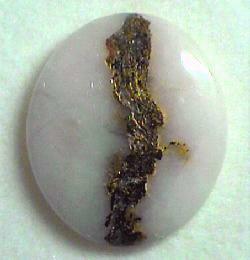 Quartz has been impregnated by epoxy to ensure long term stability. BRQ23 6.58cts 17.8 x 11.7mm flat oval Brazil SOLD Very well cut flat oval cabochon, great polish and symmetrical polished bezels. Choice broad golden rutile crystals in water clear quartz crystal. 15.94cts 17.3 x 13.7mm high dome cushion Brazil $60. Very well cut and polished, garden of golden red epidote crystals rising up from one side of the stone, evenly spaced throughout very transparent colorless quartz, unique and beautiful gem! QD1 11.51cts 17.2 x 15.9mm triangle Brazil SOLD Well cut and polished translucent light yellow gem with a beautiful fan of pyrolusite dendrites growing on a healed fracture plane. Unusual and interesting gem! Madagascar SOLD Well cut and polished, silver gray native bismuth crystals suspended in light pink transparent rose quartz, unique and beautiful gem!